Over the past eight months, Google has been steadily introducing impressive new features, most notably a brand-new form of Google Analytics. With the old version scheduled to be eliminated in early 2012, Mashable.com recently compiled what marketers need to know about the new digital standard. 1. 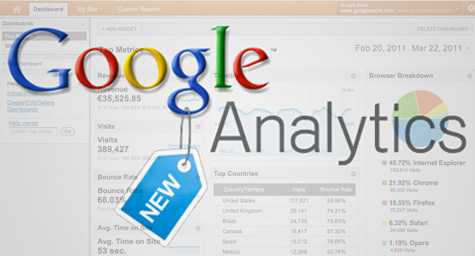 Real-Time Data Reports – At last, the new Google Analytics allows you to view site activity in real-time. This is especially useful for testing campaign tracking before launch. 2. Social Engagement Reports – Users now have the tools to track and report various social interaction on their sites. 3. Simpler Navigation Via Search – This new version includes a menu search tool that saves time and trouble when navigating a report. 4. Webmaster Tools – Through the integration of Google Webmaster Tools, users can gain more accurate insight on factors driving site traffic. 5. Flow Visualization – This consists of Visitors Flow reports which can be used to visualize the flow of visitors through the site, as well as Goal Flow reports which are an update to the previous Funnel Visualization reports. 6. Multi-Channel Funnels – These reports help marketers with attribution. Now they allow for more comprehensive data, so specific departments can get credit for their conversion contributions at different stages of the process rather than only in the final funnel. 7. Site Speed Information – Now a standard feature, these site speed reports provide important information about page load time, which is increasingly important in organic search rankings. 8. Keyword Clouds – These clouds make it simple to display top keywords based on specific criteria. 9. Event Tracking – This new feature enables users to easily track events without compromising simultaneous metrics. 10. Revamped Dashboards – In the new version, it’s possible to create up to 20 dashboards, which can be personalized with a variety of formats and features. Useful formats include timelines for visits and bounce rates, as well as source tables. The new Google Analytics should be warmly welcomed by marketers because it offers many useful features that can expand and enhance their marketing capabilities. To learn how the new Google analytics features can improve your marketing efforts, contact MDG today.